You can archive messages if you want to keep them but remove them from your Inbox. Note: You cannot archive sent messages. 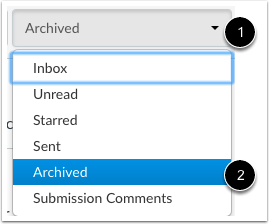 To select multiple messages to archive, click the message checkbox or press the command key (Mac) or the control key (Windows) while clicking each message you want to select. You can also click the checkbox or use the same keyboard command to deselect a message. To select all messages, click the command + A keys (Mac) or the control + A keys (Windows). 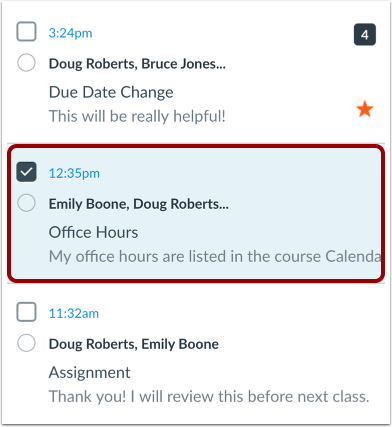 To select a range of messages, click the first message you want to select, hold down the Shift key, and then click the last message you want to select. All messages between the first and the last messages will be selected. To view archived messages, click the Inbox drop-down menu . Select the Archived link . To unarchive a message, click the message you want to unarchive . Click the Unarchive icon . 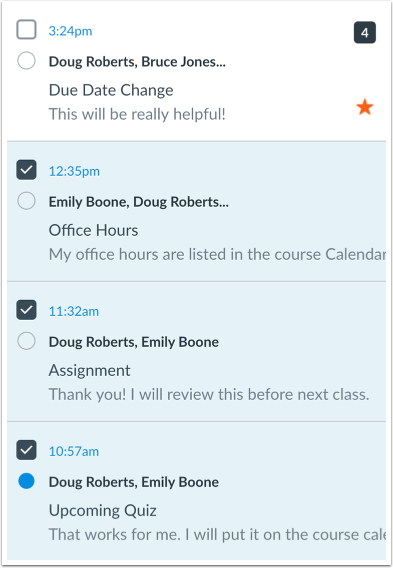 Previous Topic:How do I delete a message from a conversation as a student? Next Topic:How do I use the Course Home Page as a student? Table of Contents > Conversations > How do I archive a conversation as a student?